Camden Avenue at White Oaks Road is closed in both directions for a gas leak investigation. April 7, 2016. Snarled traffic and long commutes were in store for Campbell residents Thursday, following a major gas leak that caused a shelter-in-place alert and wreaked havoc on commuters' schedules. Frefighters and utility crews were on hand to fight the leak, which had been capped just after 3 p.m. The leak was first reported at 12:51 p.m. at 1311 Camden Ave., near White Oaks Road and state Highway 17. 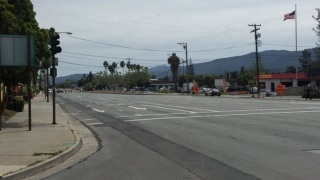 PG&E spokeswoman Mayra Tostado said traffic on Camden Avenue from Highway 17 to Erin Way is closed and may be closed until 5:15 p.m.
Around 3:45 p.m., police said the leak had been contained and gas shut off. Eastbound Camden Avenue was expected to reopen within the hour, followed by a westbound lane. Other westbound lanes, however, will remain cordoned off until further notice, police said. Most traffic had returned to normal just after 5:30 p.m.
A construction crew hit a marked 2-inch steel gas line as the crew was boring. Santa Clara County Fire Department officials originally reported the line was 10 inches in size. Tostado said a Shell gas station and a Foster's Freeze fast food restaurant were evacuated as a precaution. Utility officials are investigating why the construction crew hit the gas line since it was marked. Santa Clara County Fire Department spokeswoman Stephanie Stuehler said fire officials called for additional resources because the leak is near a busy intersection and they want to make sure people are safe. No one has been injured as a result of the gas leak.